… and that time has come for me. At the end of this week, I’ll be packing up my life in Cleveland, and moving to Baltimore to work for the Baltimore Ravens digital media team. Growing up as a sports fan, it has been a dream of mine to work in the NFL, and this job gives me the unique opportunity to fulfill that goal with one of the best franchises in the pro sports. ESPN gets flak for just about everything they do. Fair or not, the “Worldwide Leader” has their every move questioned, critiqued and analyzed, but that’s the price that comes with sitting at the top of the sports food chain. The company’s updated social media policy is no different. Soon after ESPN released its amended social networking policy for talent and reporters, the Twittersphere took the company to task–specifically for one guideline. Social media is part of college. The most prominent social media platform was invented at a college. By a college student. For college students. It’s engrained in the college culture, and is a central means of communication for people in their late teens and early 20s. The problem, however, is when those college kids using social media are high profile athletes who generate millions of dollars for their college institutions. Then things get a little more complicated. To deal with the challenges of (student) athletes using social media–specifically Twitter–an increasingly popular strategy for college coaches has been to simply ban athletes from tweeting. It’s the easiest and most painless approach to control what information players put out there for public eyes to see. One of the longstanding–but mostly unspoken–relationships in professional sports is between the NFL and NCAA. They’re separate entities, but the NFL reaps the benefits of college football providing a free farm system capped off with made-for-TV draft. The NFL knows its has a cozy deal–one that the other professional leagues wish they could match–and the league showed on Thursday that it will do everything possible to protect that partnership. It’s become the popular buzzword in the media business, as journalists young and old work to stay relevant in a challenging and evolving climate. In the past few years, the push from news managers, editors, and professors has been for journalists to view their work as the development of a brand, rather than an endless stream of content. This is a response to a blog from Mark Cuban about the role of the online media in NBA locker rooms. I would suggest reading that before reading my response. Also, several people have already weighed in on this issue (here, here, here), and I read a number of posts before publishing my own. In 2011, the debate of web-only reporters vs. traditional media is dead. I thought. Online news organizations have risen to the top of media world, and some of the most prominent, respected journalists are employed by companies that never print a newspaper or broadcast a daily news program. CLEVELAND–This was what Cleveland fans wanted all along. It all showed something that Cavs fans didn’t see during that first game against LeBron James and the Miami Heat. Heart. NEWARK, N.J.–The journey for the three seniors on Ohio State’s team was supposed to end with cutting down the nets in Houston. Instead, it came to a sudden halt in Newark, N.J. as Kentucky’s game-winning shot with 5.4 seconds left dashed the Buckeyes’ hopes of a national championship. Sometimes it’s easy to overlook the recent success of Ohio sports. People have grown accustomed to the championships, post-season runs and individual accolades, almost to the extent that we take them for granted. Bobcats fans have been spoiled lately. The past four years have truly been a golden era for Ohio Athletics. With post-season berths, national attention and individuals going on to play professionally, the Bobcats have enjoyed team and individual success on an unprecedented level for Ohio athletics. It started with a surprising overtime victory in Muncie, Ind. It ended with cutting down the nets in Cleveland. In between, there was plenty of excitement, as the Ohio men’s basketball team carved its way through the Mid-American Conference Tournament and punched its ticket to the Big Dance for the first time since 2005. Ohio is slated to play Georgetown in the Midwest Bracket on Thursday. Ohio is a 14th seed while Georgetown, which lost the Big East final in a heartbreaker to West Virginia on Saturday, is a third seed. 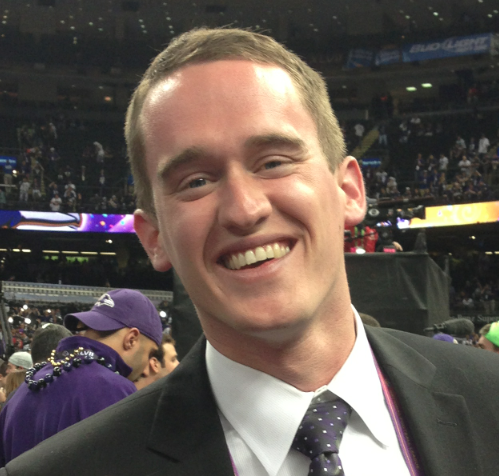 I have a background in journalism and I work on the digital team of the Baltimore Ravens. I’ve worked with media outlets at the national and local levels, covering everything from professional to high school sports, all with a digital focus. This is an intriguing time in the media world, and I’m glad to be part of it. © Copyright Garrett Downing 2010. All rights reserved.